First time on the market this three bedroom ranch home is move in ready. Has just had interior freshly painted and new lighting fixtures installed. Gleaming hardwood floors on main level. Light and bright eat-in kitchen with stainless steel appliances and Corian countertops. Master bedroom has a beautiful built-in dressing table that can be used as a desk and two large closets. Second bedroom has a built-in bookcase and large closet storage. Third bedroom is presently being used as a den but could fit a queen size pull out bed. Main bath has a soaking tub and separate shower. Walk-up attic for convenient storage. Lower level has two main rooms - Family room with brick fireplace, sliders to outside and walk in Cedar closet. Second half of lower level is more of a game area with built-in bar, half bath, huge closet that stores laundry facilities and a small side room with desk and shelves. The third room is presently being used as a workshop. 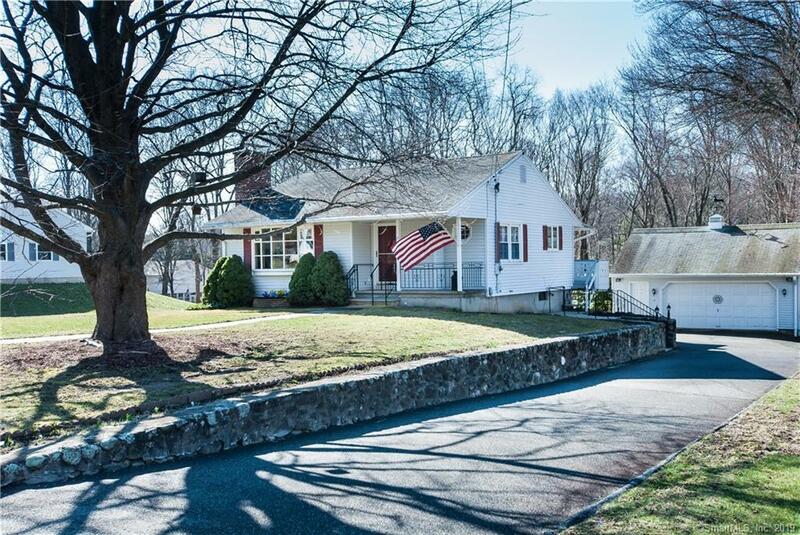 Over-sized detached two and one-half stall heated car garage with stand-up attic storage. In addition to all of this the level back yard has a patio area and separate storage shed with a automatic garage door for easy access. Easy commuter location for up or down county commuting. Directions: Ct Route 63 To Country Club Road, Right Onto Ct 188, Left On Edward Then Bear Left Onto Jensen. House Will Be On Your Right.